Thank-you for all the lovely comments! When I stay away from blogging for any length of time, it is always such a pleasure to find such encouraging comments on my return. Yes, Sue, I did make the rose on the bag. It's made from the same fabric as the red "lining" of the dress. People love to see something different from time to time when they come to the store to sign up for classes, so I feel obligated to keep churning out different versions of the same Pamela's Patterns pieces. I did cheat a little - the skirts are from a previous time. I just wasn't quite motivated to do absolutely everything over again - just the pieces that I had fabric for. The hats and mitts - those are for a beginner class that comes as a package deal - buy machine and classes to learn to sew and this is what the boss wanted as the project. 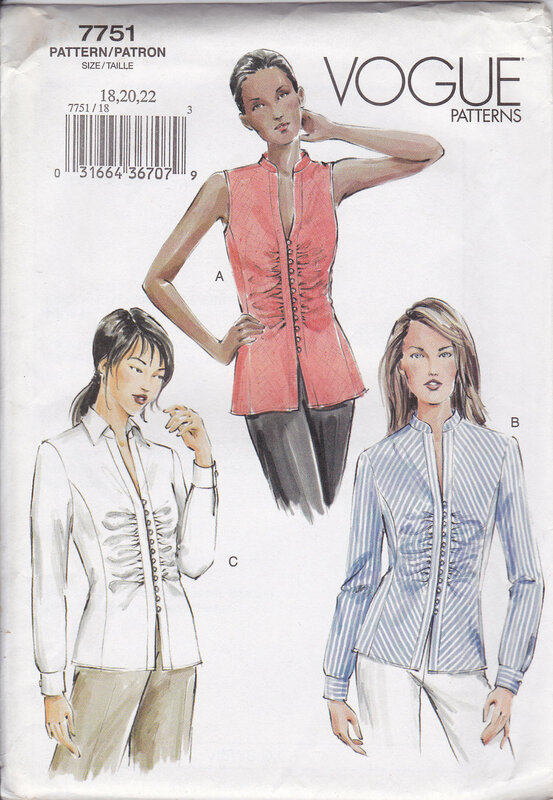 The pattern for these is Kwik Sew 3543. Can you tell that I did not pick the colours for these hats? Way too bright for me, but they do stand out rather well in the display. The pants - cheated again. A pair that was already made up. The piece that took the most work was the blouse. (for Fitting you Top class) The pattern has been sitting in the drawer for probably far too long. Copyright 2003 - rather well aged. Honestly - I was afraid that it would be a horror to fit, and every time I pulled it out, I shoved it right back in. Time to face my fears. I'm supposed to be teaching a class, and I'm afraid of a pattern? (I think that I have become overly critical and overly paranoid, and if I just got over it and got on with it, I would accomplish so much more - and that probably applies to so much more than just the fit of my clothes!) That front panel with the gathers - it's a bizarre curved thing. There is no side seam - just one of those all-in-one side pieces that defy altering. To make a long story short - I just cut the pieces as is, then took in at the tops of the princess seams and went from there. I was ready to hate this blouse. I actually like it, once all was said and done. Definitely not a blouse for those mornings when dressing in a rush. It takes time to do up 12 buttons with loops! In case you didn't get it from the last picture ... the stripes are perfectly chevron-ed on the back seam. Sometimes things work out well! Cutting out this shirt was a bit of a horror. Initially I cut two layers together, thinking that all the stripes were perfectly aligned. Not so! Thank goodness for too-big pieces of fabric - every piece (not quite, but almost) had to be cut again to line up all those darn uneven stripes. OK - so who's brilliant idea was it to use this striped fabric? Next time that I deal with stripes, I will definitely take the time at the outset to cut in a single layer. Promise. Where did August go? And for that matter, where did the first half of September go? Life has been crazy and somehow (as usual) blogging suffered. I have the greatest plans for what to write, then the post doesn't happen, and the longer I stay away, the more difficult it becomes to actually start blogging again. I have been "lurking" a bit, but I have come to realize that a lot of my inspiration for sewing actually comes from seeing and reading all the lovely blogs, and I really, really do miss the interaction. I believe I left off last time as I was leaving for camp. I made my daughter a few pairs of elastic-waisted shorts, with promises of "we'll take pictures in camp". Right! This is the only shot I managed. Not much to see of the shorts. Coming off a 12.5 mile hike, we're just not in the mood for picture-taking. And later - I had my hands full feeding the crowd. I promised to "bake" more cherry pies, just as soon as I get to them. Never again will I make cheesecake for a wedding! We almost had a disaster. My eagle-eyed cousin noticed that the cake was starting to lean. Turned out that it had started to melt, and the bottom layer could not hold the weight of the top layers. Cake cutting got moved up the schedule to RIGHT NOW, and we whisked the cake off to the refrigerator. Disaster averted. I was lucky to have my two chefs from Vancouver on hand to help with this fiasco. And then there was the issue of what my daughter was going to wear to the wedding, since nothing that she brought with her was even remotely a possibility. Can't look worse than the cousins from Montreal, now can we? I remembered that I had a dress hanging in the basement that had been sewn for a class sample (make your own prom dress, or some such thing). I was going to give it away, just as soon as I stripped off the antique jet beads. Good thing that didn't happen. I took in the side seams, added straps (my daughter will not wear strapless), which also required stripping beads then adding them back and was done three hours before the wedding. (Not bad?!) And again - too busy with the cake and all, and no picture was taken with my daughter looking gorgeous. She was kind enough to pop the dress on the day she was leaving, so the overall look is less than spectacular. On the day, she certainly did not have bra straps showing! Oh - even had a matching bag. This week I need to head over to the sewing store with my camera and take some pictures of my class samples. Perhaps by October I'll be able to actually concentrate on getting my wardrobe needs taken care of.